Andy Simpson, co-founder of Rare Whisky 101, has stressed the need for buyers to be wary of Scotch whisky sold in parts of the secondary market. 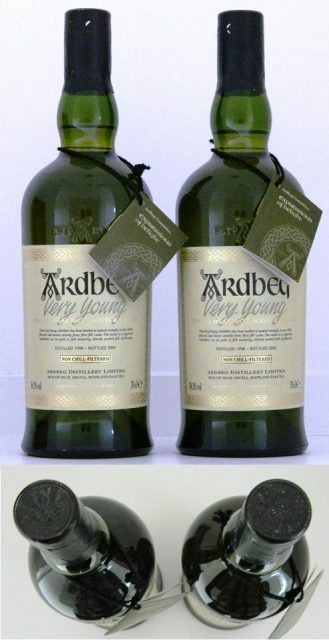 One of these bottles was carefully opened and the whisky replaced with weak, cold tea. Which one? Simpson and his business partner, David Robertson, recently made headlines after finding a haul of fake Scotch worth around £850,000. As well as identifying two sets of the Macallan Fine & Rare which were being consigned to an auction, the pair themselves bought and verified as fake a bottle of 1903 Laphroaig. Speaking to the drinks business Simpson said while there were many small details that only whisky geeks or authenticators would ever spot, there were some clearer indicators that more ‘lay’ collectors should always bear in mind – many of them identical to those which wine collectors should also be on the look out for. They are: the colour of the liquid (particularly across a vertical of spirits), fill levels and label condition. As the set reputedly contained a bottling of the 1926, which “is a very dark liquid”, clearly this had to be wrong. He noted too that every bottle of the Macallan in the Fine & Rare bottling has a unique code on the back label and sometimes forgers get lazy. Two of the bottles in one of the sets he identified had the same code – “a fatal error”. Unlike many fine wines that are sealed under cork, most whiskies are sealed under a T-cork, which can be removed by hand leaving the closure undamaged. Simpson went on to say that if the capsule was poorly fitted over the top then the task of removing it and replacing the liquid within was frighteningly simple. He said that by way of demonstration he’d done it before with a bottle of Ardbeg ‘Very Young’, which had notoriously poorly fitted capsules. Removing the capsule and cork he emptied the whisky from the bottle, replaced it with cold tea and re-sealed it. Despite claiming not to have done a very good job the results are displayed in the lead image. Which is the fake? The addition of tamper-proof seals to capsules is becoming increasingly common. The Macallan for one has one which is, “extremely difficult to remove” and usually disintegrates if it is. But many older bottlings already in the market won’t have them and a refilled bottle was one of the hardest types of fake to spot as the outside packaging will otherwise be perfectly correct. Admittedly, the market for fake whiskies is generally still centred on the more expensive end of the spectrum and Simpson said that Rare Whisky 101 had a “black list” of the most commonly faked whiskies. What they’d like to get hold of is “the Rolls Royce of the collecting market” – The Macallan. One area that is likely counterfeit free are the very, very top whisky releases where the spirit is sold in hand-blown crystal decanters and so on; things that are too difficult to fake, “are not what the faker is after”. The lack of punishment also encourages the idea in the unscrupulous that it’s an almost “punishable crime”, while the propensity for the victims to be wealthy also leads to a feeling of antipathy from those not directly involved. Yet, as Simpson continued, it is fraud, it is a crime, and there are darker forces involved in the forgery business than the odd opportunist or practical joker. With some lone bottles, let alone a rare set, having the potential to achieve £100,000 even £250,000 the money that can be raised from the sale of fakes can be substantial and easily recycled into other, even more serious crimes.